Here are some hints for the serious whip collector. They are mainly based on personal experiences. Most common materials in whips are leather/hide, wood, cane, whalebone (e.g. 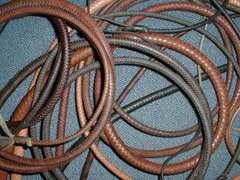 as cores of old riding whips). Leather should be cared with an uncoloured leather dressing of the hard fat type. never use oil or animal fat. It might weaken or even destroy the leather. Wood might be affected by insects. Too dry/hot storage may make leather brittle. Moisture will cause discoloration, weakening of the structure and even mildew. If a whip is very old, it might be better not to use it again to keep its value as a collectible. Especially flea market purchases often come "without history", as most sellers on these markets are not interested in whips (advantage: low to moderate prices). A view into WorldWideWhips´ database might help to find the type. Age estimation is often difficult. A few years of abuse might turn a great whip into a wreck, while proper care might make a 100 year old whip look like new. If buying a whip, always try to get as much information as possible, for a collector the whip´s history is a part of it. Several whips can be found on online auctions, most commonly on ebay®. You will find a few fine high-end products there as well as junk (e.g. Indian "Khyber Bullwhips", Mexican tourist´s stuff, plastic riding crops and similar scrap). Regarding the good ones: I purchased several old items on online auctions. Also there are some whipmakers out there who exclusively sell via ebay®. You may get a very good product, but due to the dynamics of an auction you may end up at a far too high price, compared to other makers of similar quality. Therefore, in my links page I only recommend whipmakers who not only sell via auctions, but also directly. Whip collectors are a rare species. Therefore, try to get as much contacts to other collectors as possible. If you find a collector who is into S/M while you are not: don´t be prejudiced. S/M related whip collectors are as serious and reliable as any others! But if someone "hides" behind a P.O. box, refusing to give his full address on request, don´t trade/swop/buy/sell! REAL collectors need no disguise (my opinion).